My 3rd great-grandmother was Edith F. Collins, nee McCarter. She was born about 1789 to John McCarter and Amy Evans, probably in South Carolina. She married John M. Collins sometime before 1808. The 1810 census for John and Edith listed them with two female children under 10: S. Ann and Judah. Her father, John McCarter, was enumerated six lines down from John and Edith. The 1820 census for John and Edith shows tic marks for the same two daughters and four sons born between 1810 and 1820, plus three males born between 1805 and 1810. Since there were no males listed in the 1810 census, I cannot account for those three boys and they could have been siblings to either John or Edith or boys from the community earning keep by working. The four sons were Alexander McCarter, Thomas, William F., and John Whitten. The 1830 census was clearly a mixture of two households so the tic marks could not be effectively pulled apart. We know from other records that Edith and John had three more sons: Richard, Joel, and James B. They also had three more daughters: Edy, Amy and Sarah. Amy was my great-great-grandmother. The family moved from Spartanburg in about 1834 and the 1840 census in Fayette County was another record of a blended household of multiple adults and young children and the 1850 mortality census listed both John and Edith with Edith dying in May of 1850 in Fayette County, Alabama. Although it is assumed she is buried at the Old Mount Lebanon Cemetery, there is no headstone to mark the location. Yesterday, February 14, would have been my great-great-grandmother Amy Collins Willis’ 188th birthday. She was born February 14, 1826 to John M. and Edith F. McCarter Collins in Spartanburg County, South Carolina. Early records are often difficult to find, but we believe, based on census records, she may have been the twelfth of perhaps sixteen children born to John and Edith Collins. Census records prior to 1850 only show tick marks separated by gender and age categories for family members of heads of household. The 1830 census for John M. Collins, indicates a household of 19 people: 7 males under 20, one male between 40 and 50 and one between 50 and 60; 7 females under 10, one female 30-40 and one female 50 to 60. One set of parents probably are living with them to account for the couple between 50 and 60 and two daughters have already married and moved away from the household. The Collins family apparently had membership in the Holly Springs Baptist Church of Spartanburg. A transcription of the constitution of the church is available on the internet; John M. Collins was a member of the 1834 committee to write a church constitution to replace the one that had been lost or misplaced. At the end of the articles of their constitution, there is a listing of members of the church who were dismissed; those members include several of John’s family and of the Ballenger family who were his neighbors. The Collinses and the Ballengers moved to Fayette County, Alabama as did a number of their other neighbors. By the time Amy was about three years old, her older sister, S. Ann was married to David Loftis and Judah, was married to William J. Willis Sometime between 1831 and 1833, the Willises and Loftises moved to Fayette County, Alabama. The Collins family and Ballengers joined them in Alabama sometime after April 1834 when Amy was about eight. Her sister Judah died sometime after 1842; she had a daugther, Anna, who was born about 1842 according to the 1850 census and there are no further records of Judah’s life. Amy’s parents both died prior to the 1850 census; the 1850 U.S. Federal Mortality Schedule, which covers the time period from June 1849 to June 1850, lists them side by side, John in August of 1849 and Edith in May 1850. 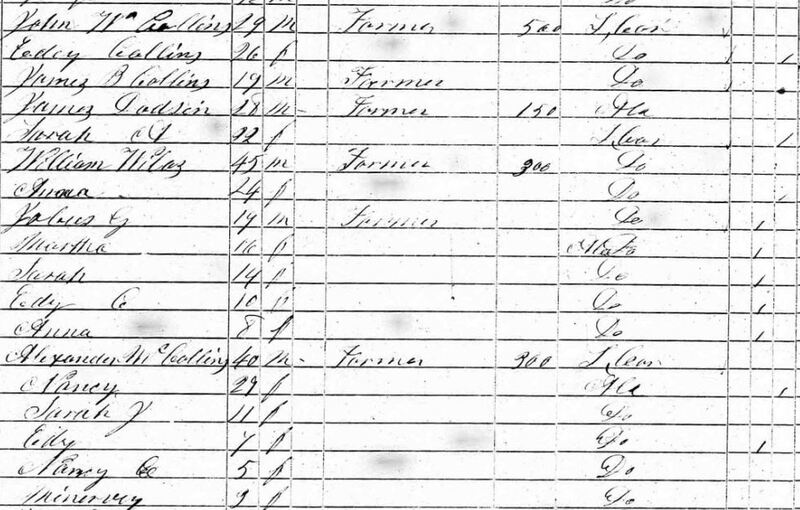 The 1850 census record shows Amy living with her brother-in-law, William Willis and her nephew and nieces, and next to her older brother, John Whitten, older sister, Edey, and younger brother, James, and her older brother, Alexander McCarter Collins and his family. We do not have a marriage record for Amy and William Willis; she appears to be listed as Ama or perhaps Amia Wilas in this record (the enumerator apparently tried making a correction to the name). Amy may well have been taking care of her sister’s children and married William out of propriety, perhaps following the death of her parents. We have some minimal estate administration records from 1855 that show William died in April of that year, leaving Amy a widow with responsibility for her younger stepchildren/nieces and their 2-year-old son, James Franklin. By the 1860 census, Amy and her son, James Franklin, were still next to her brother John Whitten and his family; her stepchildren had apparently formed separate families by that time. The ages of Amy and her brother are not accurate: J. W. should have been listed as 42 and Amy should have been listed as 34 (inaccuracies in census records are relatively common). The Civil War began in April 1861 and Alabama was heavily involved in that conflict. Many of the young men from the area around Fayette County enlisted in the Alabama 41st Infantry, including Amy’s stepson/nephew, Jabez Willis; her stepson-in-law, James Hamilton Ballenger; her brother-in-law, Zadock Graham; her future daughter-in-law’s father, John Buckner, to name a few. Zadock died in August 1862, John in September 1862, Jabez in January 1863 and James Ballenger in April 1863. On a trip to Alabama in 2010, my cousin Charles Burns, showed us some land on the corner of Old Gin Road and Ballenger Road that had belonged to what was referred to locally as “the three widows:” Amy Willis, Sarah Graham and Eady Caroline Ballenger. The 1866 Fayette County, Alabama census supports that relationship by the enumerated proximity of the three widows: In addition to the three widows, Jabez’s widow Priscilla had married William Miles who is enumerated next to the three widows. The three widows apparently lived in separate households on land held and farmed in common to provide both emotional and financial support to one another. The 1870 census reveals the same supportive relationship between the three widows as well as Amy’s ongoing connection to her brother, John Whitten Collins. Again, census records are not always fully accurate and this census record is no exception. What may be interpreted as E.E. Ballenger is actually E.C. or Eady Caroline Ballenger and her two sons and T. F. Graham is actually S. F. or Sarah F. Graham and her three sons. In addition, Amy and James Franklin or J.F., as he was most frequently identified, and her brother John and his family are living in the midst of the women. The age shown for J. F. is also not accurate – he should have been 17, although it is possible the enumerator had intended a 16 rather than a 10. The numbers in the center reflect first the property value and second personal property value; for the three widows, only Amy has property value – $200, while Eady has personal property value of $50, Amy of $200 and Sarah of $100. John’s property value was $400 with personal property value of $400. By the 1880 census, Amy’s only child was married and J.F. and Mary Jane Buckner Willis were now providing grandchildren for her to interact with. Family tradition says Amy was buried in the Willis family plot at Old Mount Lebanon Church Cemetery, which is located off Old Gin Road just a few miles east of the home where she lived near the other two widows. There is no headstone for her specifically although one of her grandsons, Delma Douglas Willis, provided a small stone that says “Willis” to represent all the Willises buried in a rather large segment of the cemetery. Her husband and his first wife, Amy’s sister Judah, are apparently buried a few feet away from the plot allocated to the immediate family members of James Franklin Willis. What I infer from these records of the life my great-great-grandmother lived is that she was a compassionate woman who saw needs and sought to meet them. As was true for many of her generation, life was frequently hard and filled with losses, but I suspect she found much joy in interacting with her stepdaughter and sister and their children and her sibling’s families and working together to accomplish more than any one of them could have accomplished alone. I think she was likely a testament to the resilience and hope of the human spirit. Once again, I have no photos of this ancestor and if some of her descendants may have photos of her, perhaps in their attic, I would relish a digital copy. My great-great-grandfather was William J. Willis. I know very little about his life. We have four records that we can tie directly to him, none that let us know specifically where he was born or who his parents were. The one most clearly identifiable is the 1850 census for Fayette County, Alabama. Although the last name is spelled Wilas, he is identifiable because of the names of two of his children, Jabus G. and Edy C., that we have been able to link to my great-grandfather, James Franklin Willis, as being his half-siblings. The things we learn from this census about William is that he was born about 1805 in South Carolina and that he could read and write. We also learn the family moved to Alabama between 1831 (Jabus’ birth in South Carolina) and 1834 (Martha’s birth in Alabama). The female listed below him is not one of his children; although he married about 1829 and had a daughter born about 1830, this female was born about 1826. William’s second wife was my great-great-grandmother, Amy E. Collins, who was born about 1826 in South Carolina and I assume the difficult-to-read name that may be Amia is likely her. Family tradition states his first wife was Amy’s sister, Judah Collins, who had died sometime between the birth of Anna (shown above to be about 1842) and the time of the 1850 census. Additional support for identifying William is that the families enumerated on either side of him were the families of Judah’s and Amy’s brothers John W. Collins, Alexander Collins and sister Sarah Collins Dodson. Moving backward in time, the 1840 census for Fayette County, Alabama, which only provides the name of the head of household and tic marks representing gender and age ranges of members of the household, shows William, born between 1800 and 1810, and his wife also born between 1800 and 1810, one son born between 1830 and 1835, two daughters born between 1835 and 1840 and one daughter born between 1830 and 1835. Those ages are consistent with what we know about William and Judah and their children: Jabez (born about 1830); Martha (born about 1833), Sarah (born about 1835) and Edy (born about 1839). Census records for Fayette County provide evidence that a fairly large number of the families had moved from Spartanburg and Union Counties in South Carolina between the 1830 and 1840 censuses, including the Collins, Ballenger, and Bobo families with which my Willis family has intermarried. An 1830 census for Spartanburg, South Carolina shows William Willis born between 1800 and 1810, a woman also born between 1800 and 1810 and a female born between 1825 and 1830. Because this is a tic mark census and because the 1840 census for William Willis does not show a daughter born between 1825 and 1830, and because of the Spartanburg County connection to Fayette County, I am assuming this is my William Willis and that their first daughter died between 1830 and 1840 and that it is possible or likely he was born in Spartanburg County, South Carolina. Census records for 1790, 1800, 1810 and 1820 in Spartanburg only two Willis families: Richard and Drucilla Pearson Barnett Willis and their children and, for a short time his brother William Willis. William only had one son who moved to Kentucky. Only one of Richard’s sons’ families, John and Martha Patsy Smith Willis, was married, living in South Carolina, and shows sons born between 1800 and 1810. Several Willis family trees list one of John and Martha’s children as being a William born about 1813. Even though these trees provide no information other than a name and approximate birth with no supporting documentation, I still have to question where that connection arose and, if they are accurate, then there is no room for another William within that family. On the other hand, my brother provided a Y-DNA sample, which we submitted to the Willis DNA project. Based on similarities and dissimilarities with the other DNA samples, it supports the likelihood that we are a part of the Richard and Drucilla Pearson Barnett Willis family, which leads me back to the only census records within that family where William might possibly fit and that is John and Martha Patsy Smith Willis. The 1860 census for Fayette County lists Amy Willis as a widow with a son, James Franklin, which places William’s death between the 1850 and 1860 censuses. Although William did not leave a will, administration papers were filed with papers dated between 12 April 1855 and February 1857 and naming his son, Jabez G. Willis as administrator. With these papers we learned William had been treated with quinine, morphine and medicinal powders for a year before he died. The net result of the accounting of his property, sales of crops and outstanding debts was a declaration of insolvency. None of his children are listed in any of the papers, other than Jabez as administrator. We found some references to Jabez Willis that seemed to refer to the father rather than the son. Because of these references, we believe William’s full name was William Jabez Willis. The Willis family in Fayette County has had a long relationship with the Mount Lebanon Baptist Church and family tradition states that William was buried in the original cemetery grounds along with his first wife, Judah. On a trip to Fayette County in 2010, my daughter and I visited the Old Mount Lebanon Cemetery with a second cousin who is still a member of that church; I took photographs of the area where they are believed to be buried. 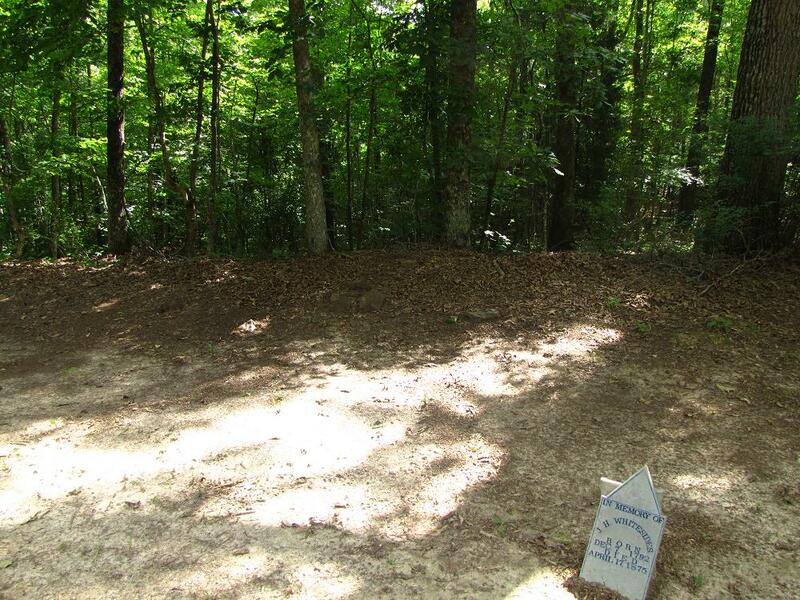 The unmarked location is only supported by family tradition but is just a few feet to the right of the location of the rest of the Willis family buried there, including his second wife, Amy, and his son, James Franklin. I have been unable to find any information on his daughters, other than Edy Caroline who married James Hamilton Ballenger. Early marriage records for Fayette County are very spotty and there are none I have found for Martha, Sarah or Anna Willis. Jabez G. Willis died during the Civil War and his widow, Mary Priscilla Middleton Willis, remarried into the Miles family. Oftentimes, daughters keep family heirlooms and it is possible information regarding William and Judah or photographs of them exist in the hands of descendants of his daughters. I would love to hear from anyone who might have more information on William Jabez Willis, his parents or any of his children.